Our devs have just told us the issue is now fixed. @Flo.Deezer i am definitely using the latest app (downloaded it a few days ago). But i have uninstalled it and reinstalled it from the link you provided just in case and i still have the same problem. Any other solutions? Hi there, have you changed your facebook password too? We re investigating this and I let you know as soon as we have any news about it! I downloaded the 4.0.5. Deezer app from the Windows Store itself. I choose Facebook login from the login screen on the app. It opens the default browser (Edge on my Surface Pro 6 / Chrome on my mais PC) and I get a message stating that "I'm in", but nothing happens. Everytime I open the app, it's the exact same thing. I've made a contact (email) to your support, and tried everything they suggested (no antivirus blocking the app, windows updated, firewall access granted) but it stills happens. New app first-screen - "What will you listen to today?" Browser tab opens - "authentication facebook; you're in!" Everytime I open the app, it's the exact same thing. I've made a contact (email) to your support, and tried everything they suggested (no antivirus blocking the app, windows updated, firewall access granted) but it stills happens." I have the same problem with Google account. The browser Chrome authenticates me to Deezer but the URL is not received by the (updated) Deezer desktop Win10 back. It just waits for authentication. I cannot use the desktop app at all since latest Windows build. There is the same issue on all my Windows computers. Hi @Pedro Jorge Matos, @Alex Miller, @Martin Avila and @Kamil Kovar, please reinstall the app, login using the account's email and password and then link your facebook/google again. Let me know if it helps! Hi, I can confirm the same happens to me with Google sign-in, just as of the latest version. @Rafael. I also tried your method but it didn't work - Still can't login using Google, just the "ordinary" account. I have the same problem. I made my own thread about it 3 weeks ago: https://en.deezercommunity.com/troubleshooting-and-tips-4/so-windows-desktop-app-was-reecently-updated-23365 and nothing's been done to fix the app. I think the devs are just actively trying to drive people away to Spotify. @Rafael. Hi again, I still cannot logon but I can see a change from last week. I am not authenticated with message "Your Google+ account was not recognized. Please try again.". Google+ is obsolete product which I don't have. The week before, I was authenticated to Google account (no plus). No matter what I will stick to my Deezer direct account for the time being. And seeing that I can't access Deezer on my Windows app, I've cancelled my premium subscription. Perhaps in the future, after the issues are resolved, gapless playback is introduced, cortana is supported, etc, etc, I'll reenable my subscription. Until then, I'm done. Hey I hope I'm looking in the right place for help with this issue. Basically I just downloaded the Deezer Music desktop app which was advertised in an email to me from Deezer. I downloaded the app from the Microsoft Store, and when I go to login by clicking Facebook (which is how I log in on browser) it just opens my browser (Chrome) and displays the words "You're in!" 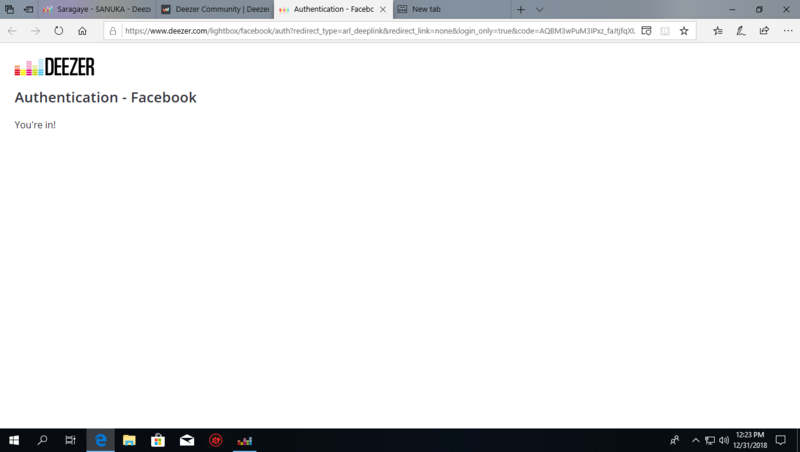 under the title "Authentication - Facebook". 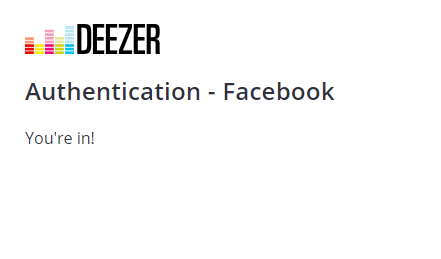 This would be because Deezer already has permission to use my Facebook account. I have already tried removing permission and then using the app login to try and re-grant it but this just grants it without successful login to the app. Please somebody fix this bug, or tell me how to fix it. Please look above. It's currently being investigated.